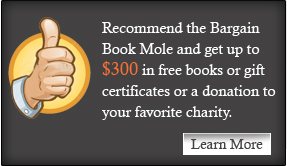 The Bargain Book Mole was started because as a big book buyer and professional bookseller, I was frustrated by the price searchers out there. They tend to be slow and a bit cumbersome and I love having the an add-on that lets me search for prices from any website (much as we love having you visit, we figure you'll love us more if we serve you better). In other words, from our perspective, the customer was not being served as well as they could. I know I tend not to be too objective on the topic, so I actually timed book searches on the most popular book price checking sites BookFinder and AddAll and found BargainBookMole was 10 - 20 times faster - and that's not comparing our website to theirs. If you use our one of our add-ons, you'll save even more time since you don't have to switch to a new website. And of course you won't find out guarantee on any other site.